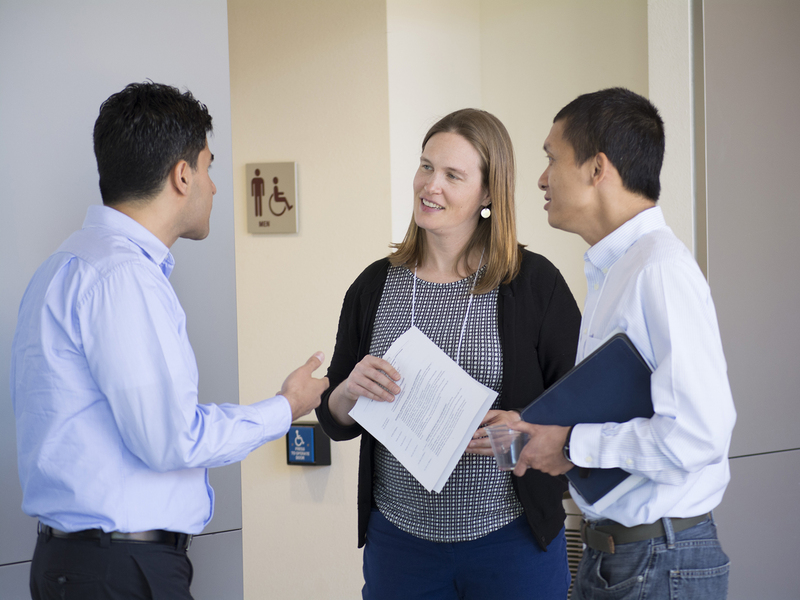 Above: Assistant Professor Sarah Stabenfeldt, MCTB Symposium chair, talks about the upcoming session with ASU Assistant Professors Mehdi Nikkhah (left) and Xiao Wang (right). Photographer: Mihir Bhatt/ASU. (Left) Julianne Holloway, assistant professor, ASU, Brendan Harley, associate professor of Chemical & Biomolecular Engineering, University of Illinois at Urbana Champaign, and Sarah Heilshorn, associate professor of materials science and engineering, Stanford University, discuss their work following their presentations during the MCTB Symposium’s first session. Photographer: Mihir Bhatt/ASU. 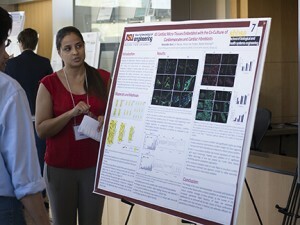 The Molecular, Cellular and Tissue Bioengineering (MCTB) Symposium held at Arizona State University on Saturday, April 2, 2016 was the first in what will be a series of annual events designed to bring ASU biomedical engineering faculty together with research centers from across the valley and the country. 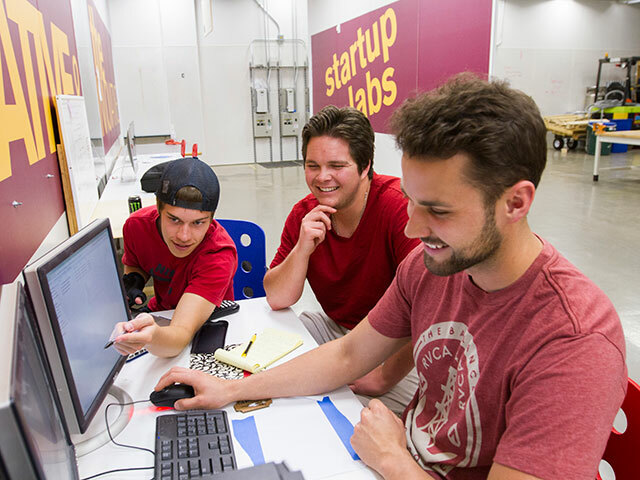 The MCTB group at ASU, cutting across multiple engineering disciplines, has partnerships with world-class clinicians, translational and basic scientists and engineers in the Phoenix area, as well as with faculty from ASU’s Biodesign Institute and School of Life Sciences. 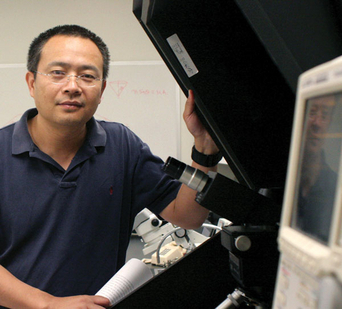 MCTB research specifically includes metabolic engineering, biosensors, molecular and nanoscale bioengineering, microelectromechanical systems (bioMEMS), cellular mechanics, drug and gene delivery and protein engineering. Four research thrusts were covered during the symposium: Regenerative Medicine and Tissue Engineering; Synthetic and Systems Biology; Biosensors and Diagnostics, and Contrast Agent and Therapeutic Delivery. The conference offered opportunities to share research-in-progress with both interdisciplinary faculty members and with clinicians and partners, according to Sarah Stabenfeldt, a bioengineering assistant professor in the School of Biological and Health Systems Engineering (SBHSE). For example, a nurse practitioner from Arizona Arrhythmia Consultants addressed patient and provider perspectives on bio-monitoring, a business development executive from Medtronic outlined what the company looks for in collaborative research projects, and a researcher from Barrow Neurological Institute addressed biological barriers to drug delivery systems. 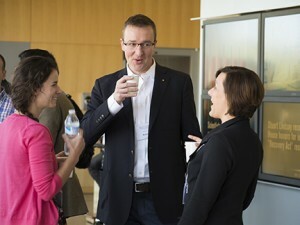 “The symposium enabled us to share new findings and directions with those who will ultimately use that research in practice; but we also heard about our partners’ priorities,” explained Stabenfeldt, who noted that attendees included representatives from area medical and research centers, such as the Mayo Clinic, Phoenix Children’s Hospital and Barrow Neurological Institute. Coordinated by SBHSE, the symposium was financially supported by the dean’s office in Ira A. Fulton Schools of Engineering and SBHSE. Participants represented “the Fulton Schools of Engineering and beyond,” Stabenfeldt explained, citing presentations by Fulton faculty from the School for Engineering of Matter, Transport and Energy (SEMTE) and the School of Electrical, Computer and Energy Engineering, as well the Biodesign Institute and the School of Life Sciences. 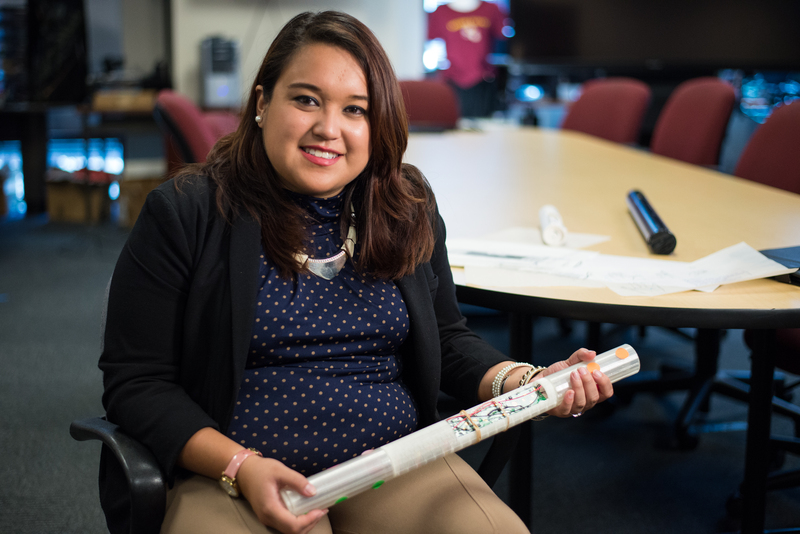 ASU biomedical engineering Ph.D. student Harpinder Saini explains her poster presentation. Photographer: Mihir Bhatt/ASU. As the symposium continues to grow, Stabenfeldt expects to attract a wider range of both presenters and attendees. “The opportunity to share the discoveries and insights across our research clusters is valuable for all of us,” she said.